As I rounded a corner at Luft5 this Sunday to see a gorgeous deep blue 959 sitting there with gunmetal grey wheels and an interior the shade of Marilyn Monroe's lipstick, I felt like the bottom had fallen out of my brain. I had known it would be there, and I even knew what color the Porsche would be beforehand, but the visual I'd crafted in my head wasn't 10% the clarity and reality of seeing the thing sitting there in front of me in the hardwood aisle of Southern California's most Porsche-filled lumber yard. 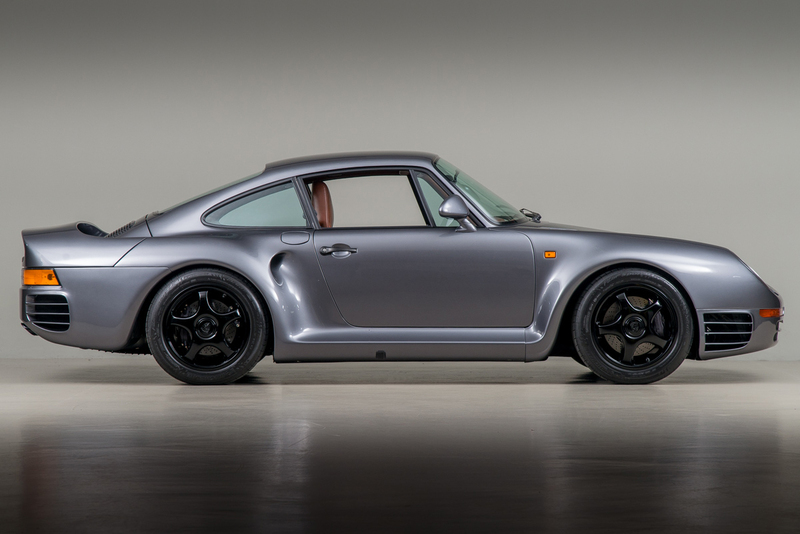 When you see a 959 in your mind's eye, it's usually a muted shade of silver, perhaps white. A small handful were painted Guards Red, but that's about as ostentatious as Porsche's iconic '80s near-200MPH supercar got. It was reserved and very German in that way, but seeing this incredible blue vision first hand completely changed the look of the 959 for me. As you may know, Bruce Canepa and his business have been inextricably linked with the story of the 959 here in the US since the beginning. 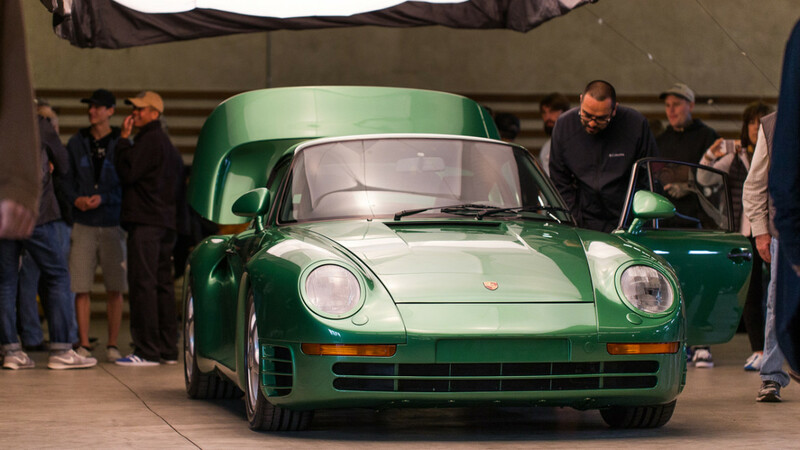 They were involved in the show and display legislation allowing significant cars like the 959 to be brought into the US on a limited basis. They were involved in gaining 50-state federalized street legality for 959 buyers with the Canepa Gen I, back in 2001. Not only was the Generation I car emissions compliant, it managed to produce 576 horsepower (up from ~450 as delivered by Porsche). Canepa has three decades of direct, hands-on experience with 959s and building this incredible Porsche to be better-than-factory new. This new 959sc (stylized lowercase as Canepa himself writes it) is the culmination of that experience. The zenith of the old-school Porsche experience. Canepa reached this level of visual perfection by spending hundreds of hours stripping the 959 down to bare bones and rebuilding it from scratch. Over 500 hours of preparation work are done to the car before it even sees a paint booth. Canepa has committed to building as many as 50 of these Porsche 959sc, and no two will be the same. Each is prepared for its specific owner, and Canepa will paint it in any color from Porsche's long history, excepting any color that has already been used. Allegedly, the next car on order will be painted Tangerine, which sounds incredible. The959's simple five spoke wheels were originally built with a special 'Denloc' bead design to keep the original Dunlop tires in place during hard launches. Canepa, years ago, developed a machining process to allow the original wheels to accept a traditional tire bead and modern compounds. The current crop of 959sc have been fitted with these modified 17" wheels, but Canepa has produced a visually identical wheel in an 18" diameter (at great expense, it should be mentioned), and will be fitting them to all 959sc models, with Michelin Pilot Sport 4S tires, naturally. 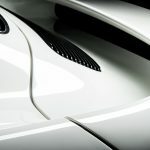 Similar to the exterior, each 959sc will feature a different interior color combination as well. The car shown at Luft5, swathed in gorgeous bright red inside, even features a dark blue deviated stitch to extend a little splash of the exterior color inside. The interior is similarly upgraded over a standard 959 with a Canepa-exclusive extended leather package, hand crafted and assembled by Canepa's in-house master trimmer. Some 300 hours go into the process. It begins by removing the aging original leather and carpet from these largely low-mile classics, and measuring each piece for replacement with the newly crafted facsimile. Everything from the dashboard to the steering wheel is expertly stitched in new high-quality leathers. It looks a good bit better than anything Porsche could have done in 1987. 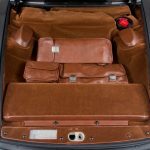 Even the front trunk is re-trimmed in matching color, and a set of matching tool bags (and leather shock tower covers) is added. The final step is the addition of a Porsche Classic radio navigation system and an all-new high fidelity sound system. 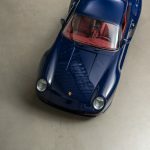 Okay, so the car looks unique on the inside and the outside, but what kind of performance benefit does Canepa bake into a Porsche 959 'SC'? Following on from the Generation I cars, Canepa built a Generation II which produced 640 horsepower. Not one to leave well enough alone, Canepa made use of modern performance parts and hot rodding know-how to create the Generation III cars with just shy of 800 horsepower. 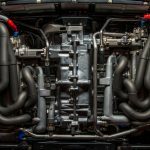 As it turns out, the 959s motorsport-derived 2.85-liter flat-six engine can handle a whole lot of boost, and pump out prodigious levels of power. If you can reliably craft almost 800 horsepower, why exactly wouldn't you? 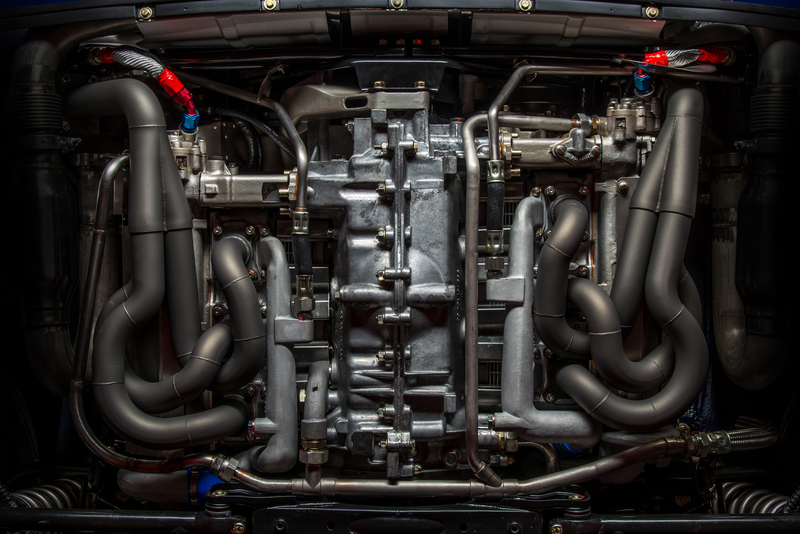 The new high-po Porsche now features a pair of no-longer-sequential Borg-Warner turbochargers, as well as modern engine management software, uprated fuel injectors, an advanced ignition system, equal-length headers, and a unique stainless-steel exhaust system all conspire to deliver huge performance numbers. Porsche's 959 has never been considered a lightweight car, being that it was around 3500 pounds in the late 1980s (a late Carrera 3.2 with a G50 gearbox is around 900 pounds lighter than the heaviest 959 Komforts, by comparison. 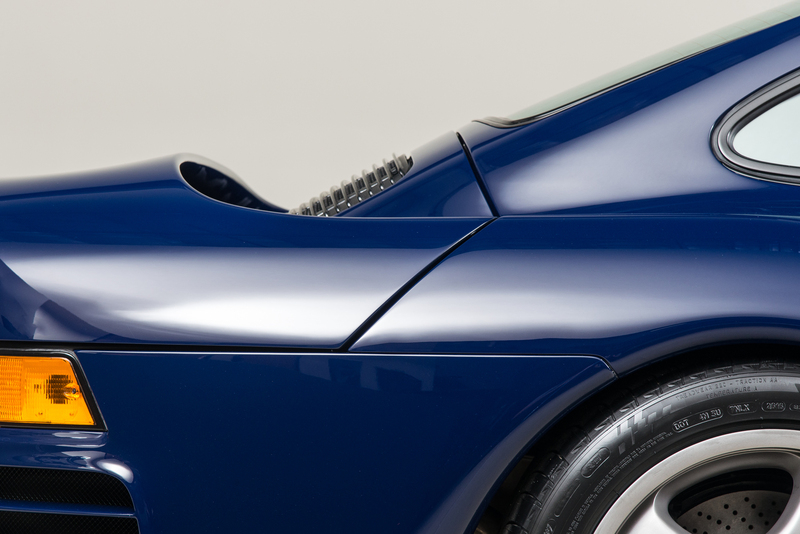 Each of the Canepa-built cars have been retrofitted with the coilover 959S suspension, dumping the Komfort's traditional hydraulically actuated suspension (even the suspension fluid filler door is covered over to be flush with the bodywork as 959S were delivered), which knocks hundreds of pounds from the car's curb weight. 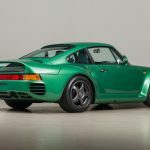 While they don't have exact weight figures, a 959S was quoted as being just a smidge under 3000 pounds, making one of these Porsche 959sc units about 700 pounds lighter than Porsche's 918 Hybrid hypercar. While it's down about 100 horsepower on the 918, it's got the performance chops to hang with a car thirty years its junior. Bruce Canepa himself claims an unofficial 0-60 time of 2.5 seconds, and he 'ran out of road' at 223 miles per hour. They're working on getting a pro driver out to verify these claims. I offered my talents, but they politely declined. If you're a tragically wealthy Porsche enthusiast with a desire for something to combine your dual passions for incredible speed and unique visual aesthetic, then a Porsche 959 Sport Canepa is the one for you. If your neighbor has a 918 Spyder, you can show them up with your one-off, 4,000 hours+ hand-assembled, 1980s icon with a similar propensity for speed, but without all the fancy computers. This is a truly analog hypercar assembled from original German components in Northern California. Four have been claimed, more are in the works, and the wait list is allegedly as long as my arm. Get your name on it before the spaces are all gone.